UNITED NATIONS, September 20 -- Outside the UN's high level meeting on Libya on Tuesday, the Permanent Representative of Cote d'Ivoire Yousoufou Bamba paced around. He asked Inner City Press, how can I get my delegation into the meeting room? Cote d'Ivoire along with Libya is claimed by France and others are a major UN good news story of the year. French President Nicolas Sarkozy, apparently to take another pressure off, urged that the controversy around Palestine seeking UN membership not overshadow what had been accomplished -- by his government, he meant -- in Libya. He also mentioned Cote d'Ivoire. 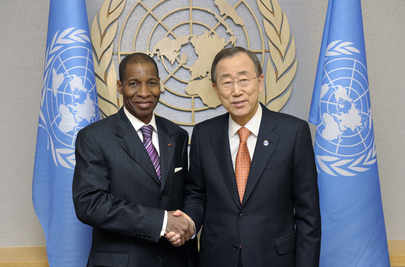 But Cote d'Ivoire's Permanent Representative and delegation weren't even allowed into the room. Inner City Press asked if the killers are, in fact, staying in UN refugee camps in Liberia, as happened for example on Rwanda's border with the DR Congo. Nesirky said of his if-asked statement, This is all I have. Nesirky said that there will be no noon briefing on Wednesday "for obvious reasons." Inner City Press asked what the reasons were. Nesirky said he anticipated the question, but others feel that all the news tomorrow will be the speeches in the General Assembly. But if Ban's UN only discloses certain deaths when asked, they shouldn't cancel their one a day briefings, as they have been trying for some time. They have a new full time Deputy Spokesman. Is a ten minute briefing to day, to take if not answer questions, too much to ask? Watch this site.